Paul the pundit, prince of prediction. 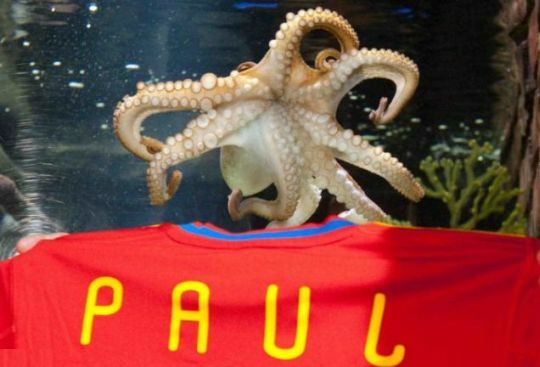 Paul the octopus, who made a name for himself during this year's football World Cup by correctly predicted the outcome of eight matches, passed away yesterday in an aquarium in Oberhausen, Germany. He was two and a half years old [says Merpel, that's about 87 in human years]. An English octopus hailing from Weymouth on the south-west coast, Paul's talents were unrecognised in the land of his birth. However, taking advantage of the European Court of Justice's Bosman ruling on freedom of labour within the European Community, he soon crossed the Channel to the Continent, where prospects for a predictive octopus are rosy. He settled into his new aquarium, out-musseled his rivals and was soon (s)quids-in. 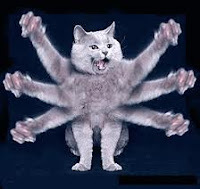 "As the tournament progressed, the octopus's uncanny knack of selecting the correct box drew increasing interest from the world's media, culminating in his choice of Spain as the eventual winner. He became an instant hero in Spain, prompting a request to have him put on display at Madrid zoo". For the record, a documentary has been filmed, and books and toys are already planned for the Christmas market. A bachelor, he enjoyed the close company of his devoted keeper. A memorial is to be erected at the aquarium in his memory. Kolpak rather than Bosman, surely? Unless Paul was already under contract to Weymouth Sea Life Park? @Tevildo: definitely Bosman -- ask Paul's agent! However, Paul’s memory may live on. Surely there could be some good business method patents involving a method and apparatus for predicting soccer tournaments. If some patent offices reject the apparatus claims on the basis of an octopus being a higher life form, we could have some good litigation to sort out whether the objections to patenting mammals carry over to octopuses. Or maybe leave out the claim relating to the living octopus and cast it as a food ingredient. In any event, a pall falls over us all. Letter from AmeriKat: Happy Halloween! Patent limericks competition: now for the winner! 2020 foresight, or time for some Union-bashing? "A picture's worth a thousand words ..." Really? Something to read, something to refer to? Applications for "There's an App"
Why be creative if you can be a mere conduit? Creative Barcode: will it do the trick? Calling all scholars, come to the Symposium! Grilled or Fried? And What About the Brand? No kidding -- a mark to get your goat!